This Policy Brief presents data from the Office of National Drug Control Policy(ONDCP) and the United Nations Office on Drugs and Crime (UNODC) demonstrating increased coca cultivation in Colombia. The brief questions whether the United States is the target for this new coca, but notes that our diminished ability to detect emerging drug trends renders this an unanswerable question. Ultimately, the brief seeks to raise public awareness of the Colombian cultivation and offers suggestions for improving the detection of emerging drug trends, particularly with respect to cocaine. The brief presents "obvious" next steps -- (1) Funding the Arrestee Drug Abuse Monitoring (ADAM) Program, (2) Restoring ONDCP's Research Funding, and (3) Dedicating Funds for Quest Diagnostic Workplace Drug Testing Data-- as well as more controversial next steps. Coca cultivation in Colombia is up—way up—and it is not clear why. This increase begs the question: do Colombian drug traffickers see something that U.S. policy makers do not? Is there a reemergence in the demand for cocaine within the U.S.? Is this a deliberate attempt by Colombian traffickers to increase the demand in the U.S.? Or do traffickers have their eyes on other markets? The honest answer is that no one knows. Not knowing is one thing, but not being able to find out is another. Arguably, our ability to spot emerging trends in the U.S. is diminishing, creating a situation where policy makers will be forced to be reactive rather than proactive in stemming the possibility of increased demand for cocaine. This policy brief seeks to raise public awareness of Colombian cultivation and suggest options for improving the detection of emerging drug use trends—with emphasis on cocaine consumption. Estimates of coca cultivation developed by the U.S. are derived from satellite imagery coupled with studies of crop yields; the satellite imagery does not cover an entire country but does target those areas where cultivation is expected.4 One could argue that the recent increases in cultivation merely reflect areas that were previously hidden or missed by satellite imagery. But the U.S. methodology is updated annually using other sources of classified information to confirm satellite findings and guide analysts. Additionally, the separate analyses conducted by the UNODC also use satellite images, but are validated by aerial reconnaissance. And the UNODC estimates also report a sharp increase in coca cultivation. So, it seems reasonable to treat these cultivation estimates as reliable. The question remains: what is driving the dramatic increase in coca cultivation in Colombia? Is Cocaine Making a Comeback? To answer this question, we first need to determine if cocaine availability and use is on the rise. Increases in initiation, or first-time use, usually precede increases in prevalence, or regular use.5 Information on initiation is reported in the National Survey on Drug Use and Health (NSDUH), but its reporting comes with a lag—making it less effective as a leading indicator. The latest NSDUH shows that drug use initiation (measured as the number of past year new initiates) did increase between 2013 and 2014, from 601,000 to 766,000. This increase was statistically significant. The level for 2013 was statistically similar to levels reported since 2008 (ranging from 623,000 to 724,000), but is much less than the roughly 1 million new initiates each year between 2002 and 2007. There were 1,530,000 regular users of cocaine in 2014, but if initiation does continue to rise (new data should be available from the NSDUH later this year), that figure will eventually grow, as will rates of dependence and abuse caused by new users moving into regular use. Drug use initiation as reported by the NSDUH is a prevalence-based indicator that counts individuals who use drugs, as compared with a consumption-based indicator that measures the quantities they consume. This comparison is important. Rather than reporting on the number of individuals using, consumption-based indicators report on the quantities used. ONDCP is the only federal entity that estimates consumption in its reports on What America’s Users Spend in Illegal Drugs.6 Since the 1990s, this report estimates not only the number of drug users, but also the number of heavy users. Knowing about heavy users is important as they account for the majority of cocaine consumed. In recent years, this series has seen substantial methodological improvements and indicates that the number of heavy users is declining. 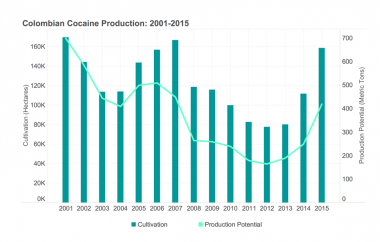 This decline in part explains why cocaine consumption fell by about 50 percent between 2006 and 2010.7,8 The other possible contributor is the reduction in cocaine availability associated with the substantial decline in coca cultivation in the mid-2000s resulting from aerial spraying and manual eradication efforts. Given this possibility, the cessation of aerial spraying of coca in 2015 does not bode well for increased coca cultivation. Another indicator of drug use trends is the Quest workforce drug testing data.9 The National Drug Threat Assessment was the first source to suggest that cocaine consumption was dropping in 2007.10 Quest data are the canary in the coal mine indicator that should continue to be watched for emerging trends. Given that it was the first source to identify the remarkable decline in cocaine consumption that began in 2007, it is logical to expect that it will detect a reversal. Quest data should be closely monitored to detect emerging drug trends. Are Other Markets the Intended Target? If the United States is not the intended target, then what other markets are Colombian traffickers pursuing? Unfortunately, surveys of cocaine use in other nations often are conducted only sporadically, if at all, and not consistently enough to establish trend data. So the simple answer is that we do not know if cocaine consumption is on the rise in these markets. In its annual World Drug Report, the UNODC publishes global cocaine consumption figures based on survey data. The 2016 report stated that, while there has been a net 30 percent increase in global cocaine use from 1998 to 2014 (the most recent year), growth in users is attributable to population growth. In this Hemisphere, the Inter-American Drug Abuse Commission (CICAD) also reports drug use trends. However, a recent reconfiguration of CICAD by the Organization of American States has significantly weakened the organization’s capacity to gather systematic data, thereby leaving this Hemisphere without any means to evaluate what is happening in Colombia. In Europe, the European Monitoring Center for Drugs and Drug Addiction (EMCDDA) is the body analyzing illicit drug markets, but their cocaine consumption-related information is limited. Only four countries—Spain, France, Finland and the United Kingdom—in their 2016 European Drug Report submitted enough data to analyze cocaine use information from 2000 onward. The EMCDDA reports that in Spain and the United Kingdom, new cocaine use among young adults has declined since 2000 (with a spike in 2008), while Finland and France have experienced a marginal increase from near zero consumption levels.11 Looking across UNODC, CICAD, and EMCDDA data, it appears that non-U.S. markets are not seeing net increases in cocaine use. For decades, cocaine was viewed by the supply reduction/law enforcement community as the primary drug threat, which resulted in an extensive infrastructure to detect and respond to cocaine consumption. However, this infrastructure may be a bit rusty. Data systems used by ONDCP to look for emerging trends have vanished. One such data system was the Arrestee Drug Abuse Monitoring (ADAM) program that surveyed arrestees in booking facilities about their frequency of drug use for many categories of drugs and included a urine test as a biological confirmation. ADAM was last conducted in 2013. At one time, as many as 35 cities were in ADAM. ONDCP even proposed expanding ADAM to as many as 50 cities in the President’s FY 2000 budget request.12 ADAM enabled ONDCP to calculate heavy drug users critical to its estimates of consumption-based estimates reported in What America’s Users Spend on Illicit Drugs. Another source of knowledge is ONDCP’s research program that funds such efforts like What America’s Users Spend on Illicit Drugs. Its ability to sponsor special research studies to inform policy has all but vanished. The Administration’s last request for resources for its Counter Technology Assessment Center (CTAC)—for technology related research—occurred in the FY 2010 Congressional budget request; spending for policy research as reported in ONDCP budget ended in FY 2011 ($1.3 million). Given its position as the federal government’s focal point for federal drug control policy, not having resources to engage the research community or grow new information surveillance systems puts national drug control policy formulation at risk. Fund ADAM: When ONDCP proposed expanding ADAM from 35 to 50 cities in FY 2000, it projected a total cost of $4.8 million for the program. Even adjusting for inflation, this seems a very small price to pay for an information system that has proved invaluable to consumption estimates. Restore ONDCP’s Research Funding: In FY 2000, ONDCP requested over $17 million for counterdrug technology and policy research. The current budget request for ONDCP does not request any funds for research. ONDCP last requested such funds in FY 2012 (and it only requested $250,000). While ONDCP can work with other federal agencies to support research priorities, not having its own funds compromises ONDCP’s ability to lead federal drug control efforts. Dedicate Funds for Quest Diagnostic Workplace Drug Testing Data: Quest data have a proven track record of detecting emerging drug use trends, particularly the change in cocaine use in the 2000s. Since Quest data come from a private sector firm, ONDCP must allocate its limited resources to obtain these data. Having funds dedicated for this purpose in Congressional appropriations to ONDCP would sustain Quest data as a valuable leading indicator. Give the Centers for Disease Control (CDC) Some Responsibility for Surveillance of Emerging Drug Trends: The CDC should have a program for emerging drugs just like it does for infectious diseases. The CDC surveillance of public health involves the systematic collection and analysis of infectious diseases as part of its preparedness and emergency response mission. Including the threat to public health associated with emerging drug abuse trends is a logical extension of its mission. Push for Aggressive Crop Eradication by Colombia: One study found the aerial spraying of herbicides to be a ridiculous waste of funding—eradication efforts that include aerial spraying are 13 times more expensive than other methods for reducing cocaine consumption14 —but the evidence points to declining cultivation when spraying was intensified. Another study suggests the possibility that source country interventions such as aerial spraying in the 2000s may be one reason for the 50 percent drop in U.S. cocaine consumption.15 Colombia just slammed the door on this option, citing health and environmental concerns from the chemical used in aerial spraying. While Colombia is justifiably focused on the peace process with rebel groups, cocaine trafficking is a significance source of revenues for those groups, so preventing more coca cultivation is in everyone’s interest. Analyze Wastewater for Drugs: This idea is not new, but the science is now mature enough to justify it. Imagine having the largest urban areas reporting data on the levels of cocaine metabolite (or any drug or metabolite) in the wastewater. The EMCDDA is fully engaged in this effort, having funded a project targeting 50 European cities.16 The Environmental Protection Agency already routinely checks the water quality at US water treatment facilities, so it should not be a major lift for it to routinely check wastewater. The advantages of this approach are that it is cheap, can be done with great frequency, poses very few privacy issues, and can provide information with great geographic specificity. It may also enable estimation of the amount of the drug consumed. The disadvantages are that it only provides an indication of the level of the drug at the population level, but that is not a problem if it is meant to provide an indicator of emerging trends. Monitor the Dark Web: The dark web (perhaps better referred to as the online anonymous marketplace) is an area where drug markets are flourishing. While law enforcement is monitoring and disrupting criminal activity, there is an opportunity to explore the dark web for knowledge about emerging drug trends. Research is demonstrating that online surveillance of anonymous marketplaces can produce much needed emerging drug trend data.17 Adding research to the federal drug policy research agenda would be a major step forward in exploring potential benefits from using online marketplaces as an early warning surveillance source. The U.S. drug policy infrastructure is almost singularly focused on opiates, and for good reason. But that does not mean that it should lose sight of other emerging drug use trends. The sharp increases in coca cultivation cannot be without consequence to cocaine availability in the world-wide market. The question is: which market is being targeted by Colombian traffickers? If the past is prologue, then the U.S. should be paying close attention. But reductions in research funding have left cocaine monitoring systems dangerously out of date. Rather than let our ability to detect emerging drug trends continue to wane, this policy brief offers recommendations for the federal drug policy community to consider soon— so we can be prepared to detect a possible resurgence of cocaine use. See the Office of National Drug Control Policy, 2016, https://www.whitehouse.gov/ondcp/targeting-cocaine-at-the-source; and the latest estimates of coca cultivation from the United Nations Office on Drugs and Crime, July 2016. World Drug Report 2016. United Nations, New York. United Nations Office on Drugs and Crime, 2016. World Drug Report 2016 (United Nations publication, Sales No. E.16.XI.7). United States Department of Justice, drug Enforcement Administration, 2015. 2015 National Drug Threat Assessment Summary. DEA-DCT-DIR-008-16. U.S Department of State, Bureau of International Narcotics and Law Enforcement Affairs, 2016. International Narcotics Control Strategy Report. Substance Abuse and Mental Health Services Administration, Center for Behavioral Health Statistics and Quality, 2015. Results from the 2014 National Survey on Drug Use and Health: Detailed Tables. Office of National Drug Control Policy, What America’s Users Spend on Illicit Drugs, Prepared by B Kilmer, S. Everingham, J. Caulkins, G. Midgette, R. Pacula, P. Reuter, R. Burns, B. Han, and R. Lundberg, Washington DC: Executive Office of the President, 2014. Caulkins, J.P., Kilmer, B., Reuter, P.H. and Midgette, G., 2015. Cocaine's fall and marijuana's rise: questions and insights based on new estimates of consumption and expenditures in US drug markets. Addiction, 110(5), pp.728-736. Between 1985 and 1988, the number of cocaine users reporting past month use fell by 50% from 6 million users to 3 million users (estimates from the National Household Survey on Drug Use, now known as NSDUH). Quest Diagnostics, Incorporated. Madison, New Jersey. Department of Justice, National Drug Intelligence Center, National Drug Threat Assessment, 2009. European Monitoring Centre for Drugs and Drug Addiction, 2016. European Drug Report 2016: Trends and Developments, Publications Office of the European Union, Luxembourg. Pages 39 & 40. Office of National Drug Control Policy, Budget Summary, various years from FY 1998 to FY 2016. Ehleringer, J.R., Casale, J.F., Barnette, J.E., Xu, X., Lott, M.J. and Hurley, J., 2012. 14 C analyses quantify time lag between coca leaf harvest and street-level seizure of cocaine. Forensic science international, 214(1), pp.7-12. Mejía, D. and Restrepo, P., 2016. The economics of the war on illegal drug production and trafficking. Journal of Economic Behavior & Organization, 126, pp.255-275. Caulkins, J.P., Kilmer, B., Reuter, P.H. and Midgette, G., 2015. Op.Cit. European Monitoring Centre for Drugs and Addiction, Perspectives on Drugs: Wastewater analysis and Drugs: a European multi-city study. Soska, K. and Christin, N., 2015. Measuring the longitudinal evolution of the online anonymous marketplace ecosystem. In 24th USENIX Security Symposium (USENIX Security 15) (pp. 33-48).